Below you fill find all funeral homes and cemeteries in or near Brooklyn. Popular neighborhoods in Brooklyn include: BoCoCa, Boerum Hill, Carroll Gardens, Cobble Hill, Brooklyn Heights, Brooklyn Navy Yard, Clinton Hill, Downtown Brooklyn, DUMBO, Fort Greene, Gowanus, Park Slope, Prospect Heights, Bridge Plaza, Brooklyn, Red Hook, Vinegar Hill, Windsor Terrace, Bushwick, Greenpoint, and Williamsburg. Suburbs of Brooklyn: Brooklyn Navy Yard, Chase Manhattan Bank, Fort Hamilton. Brooklyn is also known as: Kings County. Their current mayor is Mayor Eric Adams. Masada memorial Chapels is a unique funeral home our mission is to provide affordable traditional Jewish funerals for the residents of Brooklyn, Queens, Manhattan and Staten Island communities. Everett's HEAVENLY Funeral Home, Inc.
N.Y.C. Funeral & Cremation Service Inc.
Zip codes in the city: 11231, 11232, 11233, 11234, 11235, 11236, 11237, 11238, 11239, 11240, 11241, 11242, 11243, 11245, 11247, 11249, 11251, 11252, 11256. There are currently 202 funeral options for this city. Brooklyn has been featured in films like: Pi (1998), Annie Hall (1977), Once Upon a Time in America (1984), and The Warriors (1979). Some of the notable people born here have been: Eddie Murphy (actor and writer), Robert Longo (artist), GZA (musician and lyricist), Mitchell Kapor (entrepreneur and businessperson), Martin J. Fettman (pathologist), Patrick Fitzgerald (lawyer), and Michael Jordan (basketball player and athlete). Brooklyn is home to the following sports teams: Brooklyn Nets. Brooklyn (/ˈbrʊklɨn/) is the most populous of New York City's five boroughs, with a Census-estimated 2,621,793 people in 2014. It is geographically adjacent to the borough of Queens at the western end of Long Island. Since 1896, Brooklyn has had the same boundaries as Kings County, the most populous county in the State of New York and the second-most densely populated county in the United States, after New York County (Manhattan). With a land area of 71 square miles (180 km2) and water area of 26 square miles (67 km2), Kings County is the fourth-smallest county in New York State by land area and third-smallest by total area, though it is the second-largest among New York City's five boroughs. 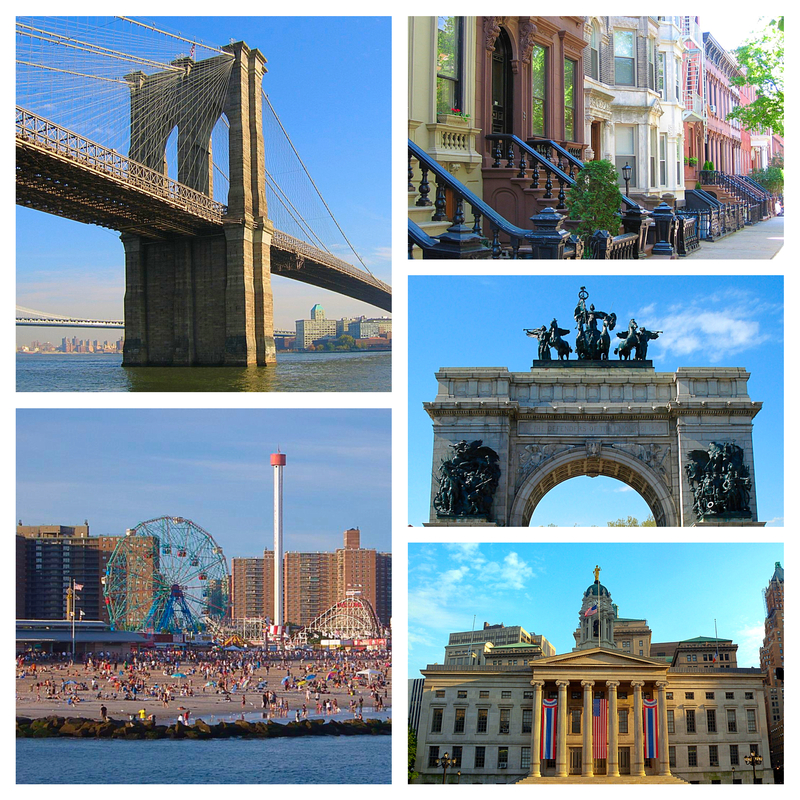 Today, if it were an independent city, Brooklyn would rank as the fourth most populous city in the U.S., behind only the other boroughs of New York City combined, Los Angeles, and Chicago.Brooklyn was an independent incorporated city (and previously an authorized village and town within the provisions of the New York State Constitution), until January 1, 1898, when, after a long political campaign and public relations battle during the 1890s, according to the new Municipal Charter of "Greater New York", Brooklyn was consolidated with the other cities, boroughs and counties to form the modern "City of New York" surrounding the Upper New York Bay with five constituent boroughs. It continues, however, to maintain a distinct culture, as befitting the former second or third largest city in America during the later 19th Century. Many Brooklyn neighborhoods are ethnic enclaves where particular ethnic and nationality groups and cultures predominate. 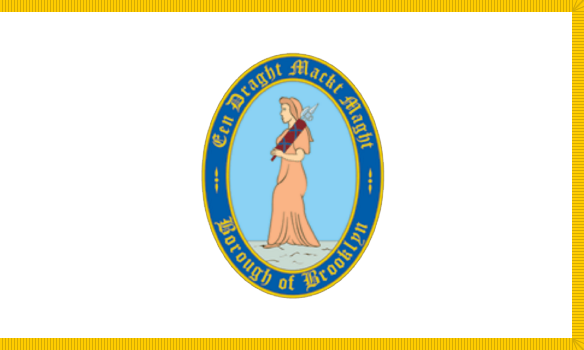 Brooklyn's official motto is Eendraght Maeckt Maght, which translates from early modern Dutch to "In unity, there is strength". The motto is displayed on the Borough seal and flag, which also feature a young robed woman bearing a bundle of bound rods known as a "fasces", a traditional emblem of Republicanism. Brooklyn's official colors are blue and gold. It was disclosed by Sarasota Herald-Tribune on March 26th, 2019 that John Joseph "Jack" Driscoll passed away in Sarasota, Florida. Driscoll was 93 years old and was born in Brooklyn, NY. Send flowers to express your sympathy and honor John Joseph "Jack"'s life. It was reported by Orange County Register on March 26th, 2019 that Geraldine "Gerry" Whitney (O'Brien) passed on in Laguna Niguel, California. Ms. Whitney was 98 years old and was born in Brooklyn, NY. Send flowers to share your condolences and honor Geraldine "Gerry"'s life. It was written on March 24th, 2019 that Joseph D Colaciello passed on in Florida. Colaciello was 85 years old and was born in Brooklyn, NY. Send flowers to share your condolences and honor Joseph D's life. It was revealed on March 24th, 2019 that Jeanette Victoria French passed on in Florida. French was 78 years old and was born in Brooklyn, NY. Send flowers to express your sorrow and honor Jeanette Victoria's life. It was disclosed by Register Guard on March 24th, 2019 that Bonnie Witkin-Stuary (Witkin) passed away in Lane Co, Oregon. Ms. Witkin-Stuary was 58 years old and was born in Brooklyn, NY. Send flowers to share your condolences and honor Bonnie's life. It was written by Topeka Capital-Journal on March 20th, 2019 that Norma Diane Broxterman (Tussel) passed away in Topeka, Kansas. Ms. Broxterman was 84 years old and was born in Brooklyn, NY. Send flowers to share your condolences and honor Norma Diane's life. It was written on March 19th, 2019 that Francesca Maria Devito (Corso) passed on in Floyd, Virginia. Ms. Devito was 90 years old and was born in Brooklyn, NY. Send flowers to express your sympathy and honor Francesca Maria's life. It was noted on March 18th, 2019 that Nicholas Sacripante died in New Port Richey, Florida. Sacripante was 94 years old and was born in Brooklyn, NY. Send flowers to express your sympathy and honor Nicholas's life. It was noted by Bluefield Daily Telegraph on March 17th, 2019 that Shepherd Alvin Friedman passed on in Princeton, West Virginia. Friedman was 72 years old and was born in Brooklyn, NY. Send flowers to express your sorrow and honor Shepherd Alvin's life. It was reported on March 14th, 2019 that Hugo Schmidt died in Tampa, Florida. Schmidt was 98 years old and was born in Brooklyn, NY. Send flowers to express your sympathy and honor Hugo's life. In 1883, the Brooklyn Bridge was completed, and transportation to Manhattan no longer required a boat trip. Brooklyn's population expanded more than threefold between 1800 and 1820, doubled again in the 1820s, and doubled yet again during the 1830s. Loyalists swelled the population of the surrounding area, including Brooklyn. Correspondingly, the region became the focus of General Washington's intelligence activities (see 'Intelligence in the American Revolutionary War'). In August and September of 1776, the Battle of Long Island (also called the 'Battle of Brooklyn') was fought in Kings County. The funeral for Gloria Grimes Thames, 71, of Brooklyn, N.Y., and formerly of Bamberg ... She attended the public schools in Bamberg. Upon moving to New York, she married Henry Thames. Gloria was a member of Brownsville Baptist Community Church. New York, New York . LAWLOR John C ... Visiting Friday 2-4 & 7-9 P.M. at CLAVIN FUNERAL HOME, 7722 4th Ave., Brooklyn. Mass of Christian Burial Saturday 9:30 A.M. at St. Ephrem's R.C. Church McKENNA John J. on November 2, 2010. Funerals in Brooklyn, NY on Yahoo! Local Get Ratings & Reviews on Funerals with Photos, Maps, Driving Directions and more. Find Brooklyn, NY funeral directors locations and reviews on Insider Pages. Visit our funeral home in Brooklyn, New York, for more information about our cremation services. We work with local florists and flower shops to offer same day delivery. You will find budget sympathy flowers in Brooklyn here. Our funeral flowers are cheap in price but not in value.